Folate, distinct forms of which are known as folic acid, folacin, and vitamin B9, is one of the B vitamins. It may be taken by mouth or by injection. The recommended adult daily intake of folate in the U.S. is 400 micrograms from foods or dietary supplements. Folate in the form of folic acid is used to treat anemia caused by folic acid deficiency. Folic acid is also used as a supplement by women during pregnancy to reduce the risk of neural tube defects (NTDs) in the baby. Low levels in early pregnancy are believed to be the cause of more than half of babies born with NTDs. More than 80 countries use fortification of certain foods with folic acid as a measure to decrease the rate of NTDs. Long-term supplementation is also associated with small reductions in the risk of stroke and cardiovascular disease. No common side effects are known. There are concerns that large amounts of folic acid might hide vitamin B12 deficiency. Folate is essential for the body to make DNA, RNA, and metabolise amino acids, which are required for cell division. As humans cannot make folate, it is required from the diet, making it an essential vitamin. Not consuming enough folate can lead to folate deficiency. This may result in a type of anemia in which low numbers of large red blood cells occur. Symptoms may include feeling tired, heart palpitations, shortness of breath, open sores on the tongue, and changes in the color of the skin or hair. Folate deficiency in children may develop within a month of poor dietary intake. In adults, normal total body folate is between 10 and 30 mg with blood levels of greater than 7 nmol/L (3 ng/mL). Folic acid was discovered between 1931 and 1943. It is on the World Health Organization's List of Essential Medicines, the most effective and safe medicines needed in a health system. The wholesale cost of supplements in the developing world is between US$0.001 and 0.005 per dose as of 2014. The term "folic" is from the Latin word folium (which means leaf) because it was found in dark-green leafy vegetables. Folates occur naturally in many foods. In 2016, it was the 96th most prescribed medication in the United States, with more than 8 million prescriptions. "Folate" is the term used to name the many forms of the vitamin—namely folic acid and its congeners, including tetrahydrofolic acid (the activated form of the vitamin), methyltetrahydrofolate (the primary form found in the serum), methenyltetrahydrofolate, folinic acid, and folacin. Other names include vitamin B9, vitamin Bc, vitamin M, and pteroyl-L-glutamate. Folate is necessary for the production and maintenance of new cells, for DNA synthesis and RNA synthesis through methylation, and for preventing changes to DNA. It is especially important during periods of frequent cell division and growth, such as infancy and pregnancy. Folate deficiency hinders DNA synthesis and cell division, affecting hematopoietic cells and neoplasms the most because of their greater frequency of cell division. RNA transcription and subsequent protein synthesis are less affected by folate deficiency, as the mRNA can be recycled and used again (as opposed to DNA synthesis, where a new genomic copy must be created). Since folate deficiency limits cell division, erythropoiesis (production of red blood cells) is hindered. This leads to megaloblastic anemia, which is characterized by large, immature red blood cells. This pathology results from persistently thwarted attempts at normal DNA replication, DNA repair, and cell division, and produces abnormally large red cells called megaloblasts (and hypersegmented neutrophils) with abundant cytoplasm capable of RNA and protein synthesis, but with clumping and fragmentation of nuclear chromatin. Some of these large cells, although immature (reticulocytes), are released early from the marrow in an attempt to compensate for the anemia. Both adults and children need folate to make normal red and white blood cells and prevent anemia. Deficiency of folate in pregnant women has been implicated in NTDs; therefore, many developed countries have implemented mandatory folic acid fortification in cereals, etc. NTDs occur early in pregnancy (first month), therefore women must have abundant folate upon conception. Folate is required to make red blood cells and white blood cells and folate deficiency may lead to anemia, which causes fatigue, weakness, and inability to concentrate. Folate intake during pregnancy has been linked to a lessened risk of neural tube defects (NTDs), and for this reason there is a recommendation that any woman planning to become pregnant consume a folate-containing dietary supplement before and during pregnancy. Compliance with this recommendation is not complete, and many women become pregnant without this being a planned pregnancy, or may not realize that they are pregnant until well into the first trimester, which is the critical period for reducing risk of NTDs. Countries have implemented either mandatory or voluntary food fortification of wheat flour and other grains, or else have no such program and depend on public health and healthcare practitioner advice to women of childbearing age. A meta-analysis of global birth prevalence of spina bifida showed that when mandatory fortification was compared to countries with voluntary fortification or no fortification program, there was a 30% reduction in live births with spina bifida. The United States Preventive Services Task Force recommends folic acid as the supplement or fortification ingredient, as forms of folate other than folic acid have not been studied. A meta-analysis of folate supplementation during pregnancy reported a 28% lower risk of newborn congenital heart defects. Prenatal supplementation with folic acid did not appear to reduce the risk of preterm births. One systematic review indicated no effect of folic acid on mortality, growth, body composition, respiratory, or cognitive outcomes of children from birth to 9 years old. There was no correlation between maternal folic acid supplementation and an increased risk for childhood asthma. Folate is necessary for fertility in both men and women. It contributes to spermatogenesis. Therefore, receiving sufficient amounts through the diet is necessary to avoid low fertility. Also, polymorphisms in genes of enzymes involved in folate metabolism could be one reason for fertility complications in some women with unexplained infertility. Taking folic acid over years reduced the risk of cardiovascular disease by 4%, where another study found it did not affect cardiovascular disease, even while reducing homocysteine levels. Several studies provided preliminary evidence that folate-rich diets were associated with reduced risk of cardiovascular diseases by lowering blood levels of homocysteine. Long-term supplementation with folic acid reduced the risk of stroke by 10%, which may be due to the role folate plays in regulating homocysteine concentration. A meta-analysis indicated the risk of stroke appeared to be reduced only in some individuals, so a definite recommendation regarding supplementation beyond the current RDA has not been established. Asian populations had greater protection against stroke with folate supplementation than did European or North American subjects. Observed stroke reduction is consistent with the reduction in pulse pressure produced by folate supplementation of 5 mg per day, since hypertension is a key risk factor for stroke. Folic supplements are inexpensive and relatively safe to use, which is why people who have had strokes or who have hyperhomocysteinemia are encouraged to consume daily B vitamins including folic acid. Studies on folic acid intake from food and folate supplementation with regards to cancer risk are based on the adequacy of chronic intake. Chronically insufficient intake of folate may increase the risk of colorectal, breast, ovarian, pancreas, brain, lung, cervical, and prostate cancers. Other studies showed that excessive dietary supplementation with folic acid may modestly increase the risk of certain cancers, but only prostate cancer was significant. A subsequent meta-analysis found no relationship between taking folate supplements and cancer risk of any type. Folate is important for cells and tissues that divide rapidly. Cancer cells divide rapidly, and drugs that interfere with folate metabolism are used to treat cancer. The antifolate drug methotrexate is often used to treat cancer because it inhibits the production of the active form of THF from the inactive dihydrofolate (DHF). However, methotrexate can be toxic, producing side effects, such as inflammation in the digestive tract that make eating normally more difficult. Also, bone marrow depression (inducing leukopenia and thrombocytopenia) and acute kidney and liver failure have been reported. Folinic acid, under the drug name leucovorin, a form of folate (formyl-THF), can help "rescue" or reverse the toxic effects of methotrexate. Folinic acid is not the same as folic acid. Folic acid supplements have little established role in cancer chemotherapy. Cases of severe adverse effects of accidental substitution of folic acid for folinic acid have been reported in people receiving methotrexate cancer chemotherapy. Anyone receiving methotrexate should follow medical advice on the use of folic or folinic acid supplements. The supplement of folinic acid in people undergoing methotrexate treatment is to give cells dividing less rapidly enough folate to maintain normal cell functions. The amount of folate given is depleted by rapidly dividing cells (cancer) quickly, so does not negate the effects of methotrexate. Some evidence links a shortage of folate with clinical depression. Limited evidence from randomized controlled trials showed using folic acid in addition to selective serotonin reuptake inhibitors (SSRIs) may have benefits. Research found a link between depression and low levels of folate. Folate may reduce homocysteine levels, which are associated with cognitive functions. The exact mechanisms involved in the development of schizophrenia and depression are not entirely clear, but the bioactive folate, methyltetrahydrofolate (5-MTHF), a direct target of methyl donors such as S-adenosyl methionine (SAMe), recycles the inactive dihydrobiopterin (BH2) into tetrahydrobiopterin (BH4), the necessary cofactor in various steps of monoamine synthesis, including that of dopamine. BH4 serves a regulatory role in monoamine neurotransmission and is required to mediate the actions of most antidepressants. 5-MTHF also plays both direct & indirect roles in DNA methylation, NO2 synthesis, and one-carbon metabolism. A sub-study of the Women's Antioxidant and Folic Acid Cardiovascular Study published in 2009 reported use of a nutritional supplement containing folic acid at 2,500 μg/day, pyridoxine at 50 mg/day, and vitamin B12 at 1,000 μg/day decreased the risk of developing age-related macular degeneration by 34.7%. The amount of folic acid used in this clinical trial – 2,500 μg/day – was higher than the tolerable upper intake level of 1,000 μg. A complex interaction occurs between folic acid, vitamin B12, and iron. A deficiency of one may be "masked" by excess of another, so the three must always be in balance. Folate deficiency can be caused by unhealthy diets that do not include enough vegetables and other folate-rich foods; diseases in which folates are not well absorbed in the digestive system (such as Crohn's disease or celiac disease); some genetic disorders that affect levels of folate; and certain medicines (such as phenytoin, sulfasalazine, or trimethoprim-sulfamethoxazole). Folate deficiency is accelerated by alcohol consumption, possibly by interference with folate transport. Folate deficiency may lead to glossitis, diarrhea, depression, confusion, anemia, and fetal neural tube and brain defects. Other symptoms include fatigue, gray hair, mouth sores, poor growth, and swollen tongue. Folate deficiency is diagnosed by analyzing a Complete blood count (CBC) and plasma vitamin B12 and folate levels. A serum folate of 3 μg/L or lower indicates deficiency. Serum folate level reflects folate status, but erythrocyte folate level better reflects tissue stores after intake. An erythrocyte folate level of 140 μg/L or lower indicates inadequate folate status. Serum folate reacts more rapidly to folate intake than erythrocyte folate. Increased homocysteine levels suggest tissue folate deficiency, but homocysteine is also affected by vitamin B12 and vitamin B6, renal function, and genetics. One way to differentiate between folate (vitamin B9) deficiency from vitamin B12 deficiency is by testing for methylmalonic acid (MMA) levels. Normal MMA levels indicate folate deficiency and elevated MMA levels indicate vitamin B12 deficiency. Folate deficiency is treated with supplemental oral folic acid of 400 to 1000 μg per day. This treatment is very successful in replenishing tissues, even if deficiency was caused by malabsorption. People with megaloblastic anemia need to be tested for vitamin B12 deficiency before treatment with folic acid, because if the person has vitamin B12 deficiency, folic acid supplementation can remove the anemia, but can also worsen neurologic problems. Cobalamin deficiency may lead to folate deficiency, which, in turn, increases homocysteine levels and may result in the development of cardiovascular disease or birth defects. Some studies show iron–folic acid supplementation in children under five may result in increased mortality due to malaria; this has prompted the World Health Organization to alter their iron–folic acid supplementation policies for children in malaria-prone areas, such as India. Because of the difference in bioavailability between supplemented folic acid and the different forms of folate found in food, the dietary folate equivalent (DFE) system was established. One DFE is defined as 1 μg of dietary folate. One μg of folic acid supplement counts as 1.7 μg DFE. The reason for the difference is that at least 85% of folic acid is estimated to be bioavailable when taken with food, whereas only about 50% of folate naturally present in food is bioavailable. The U.S. Institute of Medicine (IOM) updated Recommended Dietary Allowances (RDAs) and Tolerable upper intake levels (ULs) for folate in 2001. Collectively the EARs, RDAs, AIs, and ULs are referred to as Dietary Reference Intakes (DRIs). The European Food Safety Authority (EFSA) refers to the collective set of information as Dietary Reference Values, with Population Reference Intake (PRI) instead of RDA, and Average Requirement instead of EAR. AI and UL defined the same as in United States. For women and men over age 18 the PRI is set at 330 μg/day. PRI for pregnancy is 600 μg/day, for lactation 500 μg/day. For children ages 1–17 years the PRIs increase with age from 120 to 270 μg/day. These values differ somewhat from the U.S. RDAs. The United Kingdom's Dietary Reference Value for folate, set by the Committee on Medical Aspects of Food and Nutrition Policy (COMA) in 1991, is 200 μg/day for adults. The risk of toxicity from folic acid is low, because folate is a water-soluble vitamin and is regularly removed from the body through urine. One potential issue associated with high doses of folic acid is that it has a masking effect on the diagnosis of pernicious anaemia due to vitamin B12 deficiency. An additional concern raised was that low vitamin B12 status in combination with high folic acid intake appeared to increase the risk of cognitive impairment. The IOM sets ULs for vitamins and minerals when evidence is sufficient. The adult UL of 1000 μg for folate (and lower for children) refers to folic acid used as a supplement, as no health risks have been associated with high intake of folate from food sources. The EFSA reviewed the safety question and agreed with United States that the UL be set at 1000 μg. The Japan National Institute of Health and Nutrition set the adult UL at 1,300 or 1,400 μg depending on age. For U.S. food and dietary supplement labeling purposes the amount in a serving is expressed as a percent of Daily Value (%DV). For folate labeling purposes 100% of the Daily Value was 400 μg. As of the 27 May 2016 update, it was kept unchanged at 400 μg. A table of the old and new adult Daily Values is provided at Reference Daily Intake. The original deadline to be in compliance was 28 July 2018, but on 29 September 2017 the FDA released a proposed rule that extended the deadline to 1 January 2020 for large companies and 1 January 2021 for small companies. European Union regulations require that labels declare energy, protein, fat, saturated fat, carbohydrates, sugars, and salt. Voluntary nutrients may be shown if present in significant amounts. Instead of Daily Values, amounts are shown as percent of Reference Intakes (RIs). For folate, 100% RI was set at 200 μg in 2011. Folate naturally occurs in a wide variety of foods. Rich sources include yeast extract at 2620μg/100g, lentils at 479μg/100g, broad beans at 423μg/100g, common bean 205μg/100g, chickpeas at 172μg/100g, dark green leaf vegetables such as Brussels sprouts at 135μg/100g, curly kale at 120μg/100g, mature spinach at 114μg/100g, baby spinach at 161 μg/100g, many other vegetables at 175 μg/100g, boiled fresh (not pickled) beetroot at 110μg/100g, lettuce at 60 μg/100g, red bell peppers at 75 μg/100g, many herbs 170 μg/100g, spearmint at 110 μg/100g, chives at 105μg/100g, strawberries at 61 μg/100g, many legumes at 210 μg/100g, boiled dried soybeans at 54μg/100g, boiled dried (not canned) chickpeas at 66μg/100g, runner beans at 60μg/100g, many nuts including hazelnuts at 72μg/100g and walnuts at 66μg/100g, grains and other seeds including sesame at 97 μg/100g, some meat, especially liver and kidneys, eggs, and some seafood. Folate naturally found in food is susceptible to high heat and ultraviolet light, and is soluble in water. It is heat-labile in acidic environments and may also be subject to oxidation. The formation of tetrahydrofolate (FH4, also THF) begins when folic acid (F) is reduced to dihydrofolate (DHF) (FH2), which is then reduced to THF. Dihydrofolate reductase catalyses the last step. Vitamin B3 in the form of NADPH is a cofactor for both steps. Thus, hydride is transferred from NADPH to the C6 position of the pteridine ring. Folate is a carrier of C1 groups (methyl, methylene, formyl). Methylene-THF (CH2FH4) is formed from THF by the addition of a methylene bridge from one of three carbon donors: formate, serine, or glycine. For example, serine hydroxymethyltransferase catalyzes the conversion of THF to CH2-THF, extracting the C1 unit from L-serine giving glycine. This reaction provides the largest part of the one-carbon units available to the cell.Methyl tetrahydrofolate (CH3-THF, or methyl-THF) forms by reduction of methylene-THF by NADPH. Also, histidine can donate a single carbon to THF to form methenyl-THF. 10-Formyl-THF forms from two pathways. It results from oxidation of methylene-THF. It also forms from formate donating formyl group to THF. Folate derivatives participate in the biosynthesis of both purines and pyrimidines. Formyl folate is required for two of the steps in the biosynthesis of inosine monophosphate, the precursor to GMP and AMP. Methylenetetrahydrofolate donates the C1 center required for the biosynthesis of dTMP (2′-deoxythymidine-5′-phosphate) from dUMP (2′-deoxyuridine-5′-phosphate). The conversion is catalyzed by thymidylate synthase. Methyl-THF converts vitamin B12 to methyl-B12 (methylcobalamin). Methyl-B12 converts homocysteine, in a reaction catalyzed by homocysteine methyltransferase, to methionine. A defect in homocysteine methyltransferase or a deficiency of B12 may lead to a so-called "methyl-trap" of THF, in which THF converts to methyl-THF, causing a deficiency in folate. Thus, a deficiency in B12 can cause accumulation of methyl-THF, mimicking folate deficiency. Methionyl-tRNA formyltransferase catalyzes the conversion of L-methionyl-tRNAfMet into N-formylmethionyl-tRNAfMet. Formiminoglutamic acid is an intermediate in the conversion of histidine to glutamic acid, catalyzed by THF. A number of drugs interfere with the biosynthesis of folic acid and THF. Among them are the dihydrofolate reductase inhibitors such as trimethoprim, pyrimethamine, and methotrexate; the sulfonamides (competitive inhibitors of 4-aminobenzoic acid in the reactions of dihydropteroate synthetase). Valproic acid, one of the most commonly prescribed anticonvulsants that is also used to treat certain psychological conditions, is a known inhibitor of folic acid, and as such, has been shown to cause neural tube defects and cases of spina bifida and cognitive impairment in the newborn. Because of this considerable risk, those mothers who must continue to use valproic acid or its derivatives during pregnancy to control their condition (as opposed to stopping the drug or switching to another drug or to a lesser dose) should take folic acid supplements under the direction and guidance of their health care providers. Folic acid fortification is a process where folic acid is added to flour with the intention of promoting public health through increasing blood folate levels in the populace. In the U.S., food is fortified with folic acid, only one of the many naturally occurring forms of folate, and a substance contributing only a minor amount to the folates in natural foods. After the discovery of the link between insufficient folic acid and neural tube defects, governments and health organizations worldwide made recommendations concerning folic acid supplementation for women intending to become pregnant. Because the neural tube closes in the first four weeks of gestation, often before many women even know they are pregnant, many countries in time decided to implement mandatory food fortification programs. A meta-analysis of global birth prevalence of spina bifida showed that when mandatory fortification was compared to countries with voluntary fortification or no fortification program, there was a 30% reduction in live births with spina bifida. Folic acid is added to grain products in more than 80 countries, and these fortified products make up a significant source of the population's folate intake. Fortification is controversial, with issues having been raised concerning individual liberty, as well as the health concerns described in the Toxicity section. In the U.S., there is concern that the federal government mandates fortification but does not provide monitoring of potential undesirable effects of fortification. In the U.S., the fortification program was expected to raise a person's folic acid intake level by 70–130 µg/day; however, an increase of almost double that amount was actually observed. This could be from the fact that many foods are over-fortified by 160–175% over the required amount. Much of the elder population take supplements that add 400 µg to their daily folic acid intake. This is a concern because 70–80% of the population have detectable levels of unmetabolized folic acid in their blood, a consequence of folic acid supplementation and fortification, and high intakes are thought to accelerate the growth of preneoplastic lesions. Australia and New Zealand jointly agreed to wheat flour fortification through the Food Standards Australia New Zealand in 2007. The requirement was set at 135 µg of folate per 100 g of bread. Australia implemented the program in 2009. New Zealand was also planning to fortify bread (excluding organic and unleavened varieties) starting in 2009, but then opted to wait until more research was done. The Association of Bakers and the Green Party had opposed mandatory fortification, describing it as "mass medication." Food Safety Minister Kate Wilkinson reviewed the decision to fortify in July 2009, citing as reasons to oppose claims for links between over consumption of folate with increased risk of cancer. In 2012 the delayed mandatory fortification program was revoked and replaced by a voluntary program, with the hope of achieving a 50% bread fortification target. According to a Canadian survey, 58% of women said they took a folic acid containing multivitamin or a folic acid supplement as early as three months before becoming pregnant. Women in higher income households and with more years of school education were more likely to use folic acid supplements before pregnancy, as were women with planned pregnancies and those over the age of 25. Canadian public health efforts focused on promoting awareness of the importance of folic acid supplementation for all women of childbearing age and decreasing socio-economic inequalities by providing practical folic acid support to vulnerable groups of women. Folic acid food fortification became mandatory in 1998, with the fortification of 150 µg of folic acid per 100 grams of enriched flour and uncooked cereal grains. The results of folic acid fortification on the rate of neural tube defects in Canada have been positive, showing a 46% reduction in prevalence of NTDs; the magnitude of reduction was proportional to the prefortification rate of NTDs, essentially removing geographical variations in rates of NTDs seen in Canada before fortification. While the Food Standards Agency recommended folic acid fortification, and wheat flour is fortified with iron, folic acid fortification of wheat flour is allowed voluntarily rather than required. A 2018 review by authors based in the United Kingdom strongly recommended that mandatory fortification be reconsidered as a means of reducing the risk of neural tube defects. In the United States many grain products are fortified with folic acid. 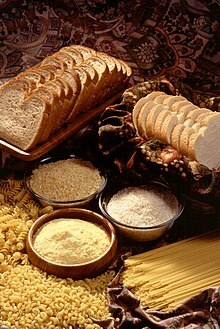 In 1996, the United States Food and Drug Administration (FDA) published regulations requiring the addition of folic acid to enriched breads, cereals, flours, corn meals, pastas, rice, and other grain products. This ruling took effect on 1 January 1998, and was specifically targeted to reduce the risk of neural tube birth defects in newborns. There were concerns expressed that the amount of folate added was insufficient. As a result of the folic acid fortification program, fortified grain foods became a major source of folic acid in the US diet. The Centers for Disease Control and Prevention in Atlanta, Georgia used data from 23 birth defect registries covering about half of United States births, and extrapolated their findings to the rest of the country. These data indicate that since the addition of folic acid in grain-based foods as mandated by the FDA, the rate of neural tube defects dropped by 25% in the United States. Before folic acid fortification, about 4,100 pregnancies were affected by a neural tube defect each year in the United States. After fortification, this number declined to around 3,000. When the U.S. Food and Drug Administration set the folic acid fortification regulation in 1996, the projected increase in folic acid intake was 100 µg/d. Mandatory fortification began 1 January 1998. The U.S. National Center for Health Statistics conducts biannual National Health and Nutrition Examination Survey (NHANES) to assess the health and nutritional status of adults and children in the United States. Some results are reported as What We Eat In America. The 2013–2014 survey reported that for adults ages 20 years and older, men consumed on average of 249 μg/d folate from food plus 207/d μg of folic acid from consumption of fortified foods, for a combined total of 601 μg/d of dietary folate equivalents (DFEs; because each microgram of folic acid counts as 1.7 μg of food folate). For women, the values are 199, 153 and 459 μg/d, respectively. This means that fortification led to a bigger increase in folic acid intake than first projected, and that more than half the adults are consuming more than the RDA of 400 μg (as DFEs), but even so, fewer than half of pregnant women are exceeding the pregnancy RDA of 600 μg/d. In the 1920s, scientists believed folate deficiency and anemia were the same condition. In 1931, researcher Lucy Wills made a key observation that led to the identification of folate as the nutrient required to prevent anemia during pregnancy. Wills demonstrated that anemia could be reversed with brewer's yeast. In the late 1930s, folate was identified as the corrective substance in brewer's yeast. It was first isolated via extraction from spinach leaves by Herschel K. Mitchell, Esmond E. Snell, and Roger J. Williams in 1941. Bob Stokstad isolated the pure crystalline form in 1943, and was able to determine its chemical structure while working at the Lederle Laboratories of the American Cyanamid Company. This historical research project, of obtaining folic acid in a pure crystalline form in 1945, was done by the team called the "folic acid boys," under the supervision and guidance of Director of Research Dr. Yellapragada Subbarow, at the Lederle Lab, Pearl River, NY. This research subsequently led to the synthesis of the antifolate aminopterin, the first-ever anticancer drug, the clinical efficacy was proven by Sidney Farber in 1948. In the 1950s and 1960s, scientists began to discover the biochemical mechanisms of action for folate. In 1960, experts first linked folate deficiency to neural tube defects. In the late 1990s, U.S. scientists realized, despite the availability of folate in foods and in supplements, there was still a challenge for people to meet their daily folate requirements, which is when the US implemented the folate fortification program. Pteridine: Substituted pteridines are intermediates in the biosynthesis of dihydrofolic acid in many microorganisms. ^ a b Fenech, Michael (May 2012). "Folate (vitamin B9) and vitamin B12 and their function in the maintenance of nuclear and mitochondrial genome integrity". Mutation Research/Fundamental and Molecular Mechanisms of Mutagenesis. 733 (1–2): 21–33. doi:10.1016/j.mrfmmm.2011.11.003. PMID 22093367. ^ a b "Definition of vitamin Bc". Medical-dictionary.thefreedictionary.com. Retrieved 9 September 2012. ^ a b Darby WJ, Jones E (1945). "Treatment of sprue with synthetic L. casei factor (folic acid, vitamin M)". Proc. Soc. Exp. Biol. Med. 60 (2): 259–262. doi:10.3181/00379727-60-15154P. PMID 21006310. ^ a b c d e f g h "Folic Acid". Drugs.com. American Society of Health-System Pharmacists. 1 January 2010. Archived from the original on 8 September 2017. Retrieved 1 September 2016. ^ "Folic Acid". The PubChem Project. Archived from the original on 7 April 2014. ^ a b c d e f g "Folate". Micronutrient Information Center, Linus Pauling Institute, Oregon State University. 2014. Retrieved 17 March 2018. ^ a b c d e f g h i j k l m n "Fact Sheet for Health Professionals - Folate". National Institutes of Health. Archived from the original on 2 April 2011. ^ Bibbins-Domingo K, Grossman DC, Curry SJ, Davidson KW, Epling JW, García FA, Kemper AR, Krist AH, Kurth AE, Landefeld CS, Mangione CM, Phillips WR, Phipps MG, Pignone MP, Silverstein M, Tseng CW (2017). "Folic Acid Supplementation for the Prevention of Neural Tube Defects: US Preventive Services Task Force Recommendation Statement". JAMA. 317 (2): 183–189. doi:10.1001/jama.2016.19438. PMID 28097362. ^ a b c Wald NJ, Morris JK, Blakemore C (2018). "Public health failure in the prevention of neural tube defects: time to abandon the tolerable upper intake level of folate". Public Health Rev. 39: 2. doi:10.1186/s40985-018-0079-6. PMC 5809909. PMID 29450103. ^ Pommerville, Glendale Community College Jeffrey C. (2009). Alcamo's Fundamentals of Microbiology: Body Systems. Jones & Bartlett Publishers. p. 511. ISBN 9780763787127. Archived from the original on 8 September 2017. ^ Marino, BS; Fine, KS (2009). Blueprints Pediatrics. Lippincott Williams & Wilkins. p. 131. ISBN 9780781782517. Archived from the original on 8 September 2017. ^ "Folic Acid". International Drug Price Indicator Guide. Retrieved 1 September 2016. ^ Chambers Concise Dictionary. Allied Publishers. 2004. p. 451. ISBN 9788186062364. Archived from the original on 8 September 2017. ^ "Folic Acid". NIH LiverTox. 2 June 2017. Archived from the original on 7 January 2017. ^ a b "FAQ's Folic Acid". CDC. 16 December 2016. Archived from the original on 10 July 2017. ^ "Nomenclature and symbols for folic acid and related compounds". IUPAC-IUB Joint Commission on Biochemical Nomenclature. Archived from the original on 6 February 2007. ^ a b Kamen B (October 1997). "Folate and antifolate pharmacology". Semin. Oncol. 24 (5 Suppl 18): S18–30–S18–39. PMID 9420019. ^ Zittoun J (1993). "Anemias due to disorder of folate, vitamin B12 and transcobalamin metabolism". La Revue du Praticien (in French). 43 (11): 1358–1363. PMID 8235383. ^ "Folate and Your Health – HealthLinkBC File #68g". Healthlink British Columbia. Archived from the original on 9 July 2012. Retrieved 9 September 2012. ^ Wilson RD, et al. (2015). "Pre-conception folic acid and multivitamin supplementation for the primary and secondary prevention of neural tube defects and other folic acid-sensitive congenital anomalies". J Obstet Gynaecol Can. 37 (6): 534–552. doi:10.1016/s1701-2163(15)30230-9. PMID 26334606. ^ a b Atta CA, Fiest KM, Frolkis AD, Jette N, Pringsheim T, St Germaine-Smith C, Rajapakse T, Kaplan GG, Metcalfe A (2016). "Global Birth Prevalence of Spina Bifida by Folic Acid Fortification Status: A Systematic Review and Meta-Analysis". Am J Public Health. 106 (1): e24–e34. doi:10.2105/AJPH.2015.302902. PMC 4695937. PMID 26562127. ^ Feng Y, Wang S, Chen R, Tong X, Wu Z, Mo X (2015). "Maternal folic acid supplementation and the risk of congenital heart defects in offspring: a meta-analysis of epidemiological observational studies". Sci Rep. 5: 8506. Bibcode:2015NatSR...5E8506F. doi:10.1038/srep08506. PMC 4330542. PMID 25687545. ^ Fekete K, Berti C, Trovato M, Lohner S, Dullemeijer C, Souverein OW, Cetin I, Decsi T (2012). "Effect of folate intake on health outcomes in pregnancy: a systematic review and meta-analysis on birth weight, placental weight and length of gestation". Nutr J. 11: 75. doi:10.1186/1475-2891-11-75. PMC 3499376. PMID 22992251. ^ Saccone G, Berghella V (2016). "Folic acid supplementation in pregnancy to prevent preterm birth: a systematic review and meta-analysis of randomized controlled trials". Eur. J. Obstet. Gynecol. Reprod. Biol. 199: 76–81. doi:10.1016/j.ejogrb.2016.01.042. PMID 26901401. ^ Devakumar D, Fall CH, Sachdev HS, Margetts BM, Osmond C, Wells JC, Costello A, Osrin D (2016). "Maternal antenatal multiple micronutrient supplementation for long-term health benefits in children: a systematic review and meta-analysis". BMC Med. 14: 90. doi:10.1186/s12916-016-0633-3. PMC 4910255. PMID 27306908. ^ Crider KS, Cordero AM, Qi YP, Mulinare J, Dowling NF, Berry RJ (2013). "Prenatal folic acid and risk of asthma in children: a systematic review and meta-analysis". Am. J. Clin. Nutr. 98 (5): 1272–1281. doi:10.3945/ajcn.113.065623. PMC 5369603. PMID 24004895. Archived from the original on 8 September 2017. ^ Ebisch IM, Thomas CM, Peters WH, Braat DD, Steegers-Theunissen RP (2007). "The importance of folate, zinc and antioxidants in the pathogenesis and prevention of subfertility". Hum. Reprod. Update. 13 (2): 163–174. doi:10.1093/humupd/dml054. PMID 17099205. ^ Altmäe S, Stavreus-Evers A, Ruiz JR, et al. (2010). "Variations in folate pathway genes are associated with unexplained female infertility". Fertil. Steril. 94 (1): 130–137. doi:10.1016/j.fertnstert.2009.02.025. PMID 19324355. ^ Bazzano LA (2011). "No effect of folic acid supplementation on cardiovascular events, cancer or mortality after 5 years in people at increased cardiovascular risk, although homocysteine levels are reduced". Evid Based Med. 16 (4): 117–118. doi:10.1136/ebm1204. PMID 21402567. ^ Wang X, Qin X, Demirtas H, Li J, Mao G, Huo Y, Sun N, Liu L, Xu X (2007). "Efficacy of folic acid supplementation in stroke prevention: a meta-analysis". Lancet. 369 (9576): 1876–1882. doi:10.1016/S0140-6736(07)60854-X. PMID 17544768. ^ Terwecoren A, Steen E, Benoit D, Boon P, Hemelsoet D (September 2009). "Ischemic stroke and hyperhomocysteinemia: truth or myth?". Acta Neurol Belg. 109 (3): 181–8. PMID 19902811. ^ Jägerstad, M (2012). "Folic acid fortification prevents neural tube defects and may also reduce cancer risks". Acta Paediatrica. 101 (10): 1007–1012. doi:10.1111/j.1651-2227.2012.02781.x. PMID 22783992. ^ Weinstein, SJ; Hartman, TJ; Stolzenberg-Solomon, R; Pietinen, P; Barrett, MJ; Taylor, PR; Virtamo, J; Albanes, D (2003). "Null association between prostate cancer and serum folate, vitamin B(6), vitamin B(12), and homocysteine". Cancer Epidemiology, Biomarkers & Prevention. 12 (11 Pt 1): 1271–1272. PMID 14652294. Archived from the original on 22 February 2017. ^ Wien TN, Pike E, Wisløff T, Staff A, Smeland S, Klemp M (2012). "Cancer risk with folic acid supplements: a systematic review and meta-analysis". BMJ Open. 2 (1): e000653. doi:10.1136/bmjopen-2011-000653. PMC 3278486. PMID 22240654. ^ Wang, R; Zheng, Y; Huang, JY; Zhang, AQ; Zhou, YH; Wang, JN (2014). "Folate intake, serum folate levels, and prostate cancer risk: a meta-analysis of prospective studies". BMC Public Health. 14 (1): 1326. doi:10.1186/1471-2458-14-1326. PMC 4320532. PMID 25543518. ^ Schwingshackl L, Boeing H, Stelmach-Mardas M, Gottschald M, Dietrich S, Hoffmann G, Chaimani A (2017). "Dietary Supplements and Risk of Cause-Specific Death, Cardiovascular Disease, and Cancer: A Systematic Review and Meta-Analysis of Primary Prevention Trials". Advances in Nutrition. 8 (1): 27–39. doi:10.3945/an.116.013516. PMC 5227980. PMID 28096125. Archived from the original on 8 September 2017. ^ Rubio IT, Cao Y, Hutchins LF, Westbrook KC, Klimberg VS (1998). "Effect of glutamine on methotrexate efficacy and toxicity". Ann. Surg. 227 (5): 772–780. doi:10.1097/00000658-199805000-00018. PMC 1191365. PMID 9605669. ^ Wolff JE, Hauch H, Kuhl J, Egeler RM, Jurgens H (1998). "Dexamethasone increases hepatotoxicity of MTX in children with brain tumors". Anticancer Research. 18 (4B): 2895–2899. PMID 9713483. ^ Kepka L, De Lassence A, Ribrag V, et al. (1998). "Successful rescue in a patient with high dose methotrexate-induced nephrotoxicity and acute renal failure". Leuk. Lymphoma. 29 (1–2): 205–209. doi:10.3109/10428199809058397. PMID 9638991. ^ Branda RF, Nigels E, Lafayette AR, Hacker M (1998). "Nutritional folate status influences the efficacy and toxicity of chemotherapy in rats". Blood. 92 (7): 2471–2476. PMID 9746787. ^ Shiroky JB; Frcp(c) (1997). "The use of folates concomitantly with low-dose pulse methotrexate". Rheum. Dis. Clin. North Am. 23 (4): 969–980. doi:10.1016/S0889-857X(05)70369-0. PMID 9361164. ^ Keshava C, Keshava N, Whong WZ, Nath J, Ong TM (1998). "Inhibition of methotrexate-induced chromosomal damage by folinic acid in V79 cells". Mutat. Res. 397 (2): 221–228. doi:10.1016/S0027-5107(97)00216-9. PMID 9541646. ^ Coppen A, Bolander-Gouaille C (2005). "Treatment of depression: time to consider folic acid and vitamin B12". J. Psychopharmacol. (Oxford). 19 (1): 59–65. doi:10.1177/0269881105048899. PMID 15671130. ^ Taylor MJ, Carney SM, Goodwin GM, Geddes JR (2004). "Folate for depressive disorders: systematic review and meta-analysis of randomized controlled trials". J. Psychopharmacol. (Oxford). 18 (2): 251–256. doi:10.1177/0269881104042630. PMID 15260915. ^ Gilbody S, Lewis S, Lightfoot T (2007). "Methylenetetrahydrofolate reductase (MTHFR) genetic polymorphisms and psychiatric disorders: a Huge review". Am. J. Epidemiol. 165 (1): 1–13. doi:10.1093/aje/kwj347. PMID 17074966. ^ Gilbody S, Lightfoot T, Sheldon T (2007). "Is low folate a risk factor for depression? A meta-analysis and exploration of heterogeneity". J Epidemiol Community Health. 61 (7): 631–637. doi:10.1136/jech.2006.050385. PMC 2465760. PMID 17568057. ^ Krebs MO, Bellon A, Mainguy G, Jay TM, Frieling H (2009). "One-carbon metabolism and schizophrenia: current challenges and future directions". Trends Mol Med. 15 (12): 562–570. doi:10.1016/j.molmed.2009.10.001. PMID 19896901. ^ Christen WG, Glynn RJ, Chew EY, Albert CM, Manson JE (2009). "Folic acid, pyridoxine, and cyanocobalamin combination treatment and age-related macular degeneration in women: the Women's Antioxidant and Folic Acid Cardiovascular Study". Arch. Intern. Med. 169 (4): 335–341. doi:10.1001/archinternmed.2008.574. PMC 2648137. PMID 19237716. ^ Vreugdenhil G, Wognum AW, van Eijk HG, Swaak AJ (1990). "Anaemia in rheumatoid arthritis: the role of iron, vitamin B12, and folic acid deficiency, and erythropoietin responsiveness". Ann. Rheum. Dis. 49 (2): 93–98. doi:10.1136/ard.49.2.93. PMC 1003985. PMID 2317122. ^ Reynolds E (2006). "Vitamin B12, folic acid, and the nervous system". Lancet Neurol. 5 (11): 949–960. doi:10.1016/S1474-4422(06)70598-1. PMID 17052662. ^ Allen RH, Stabler SP, Savage DG, Lindenbaum J (1990). "Diagnosis of cobalamin deficiency I: usefulness of serum methylmalonic acid and total homocysteine concentrations". Am. J. Hematol. 34 (2): 90–98. doi:10.1002/ajh.2830340204. PMID 2339683. ^ a b "Folate deficiency: MedlinePlus Medical Encyclopedia". www.nlm.nih.gov. Archived from the original on 17 November 2015. Retrieved 16 November 2015. ^ Hamid A, Wani NA, Kaur J (2009). "New perspectives on folate transport in relation to alcoholism-induced folate malabsorption—association with epigenome stability and cancer development". FEBS J. 276 (8): 2175–2191. doi:10.1111/j.1742-4658.2009.06959.x. PMID 19292860. ^ a b c d e f Institute of Medicine (1998). "Folate". Dietary Reference Intakes for Thiamin, Riboflavin, Niacin, Vitamin B6, Folate, Vitamin B12, Pantothenic Acid, Biotin, and Choline. Washington, DC: The National Academies Press. pp. 196–305. ISBN 978-0-309-06554-2. Retrieved 29 August 2017. ^ Lohner, S; Fekete, K; Berti, C; Hermoso, M; Cetin, I; Koletzko, B; Decsi, T (2012). "Effect of folate supplementation on folate status and health outcomes in infants, children and adolescents: A systematic review". International Journal of Food Sciences and Nutrition. 63 (8): 1014–1020. doi:10.3109/09637486.2012.683779. PMID 22574624. ^ Varela-Moreiras G, Murphy MM, Scott JM (2009). "Cobalamin, folic acid, and homocysteine". Nutrition Reviews. 67 Suppl 1: S69–S72. doi:10.1111/j.1753-4887.2009.00163.x. hdl:2262/34510. PMID 19453682. ^ Pasricha S, Shet A, Sachdev HP, Shet AS (October 2009). "Risks of routine iron and folic acid supplementation for young children" (PDF). Indian Pediatr. 46 (10): 857–66. PMID 19887691. Archived (PDF) from the original on 12 June 2010. ^ "Nutrition Requirements" (PDF). British Nutrition Foundation. Retrieved 8 July 2018. ^ a b c d Smith AD (2007). "Folic acid fortification: the good, the bad, and the puzzle of vitamin B-12". Amer J Clinical Nutrition. 85 (1): 3–5. doi:10.1093/ajcn/85.1.3. PMID 17209170. ^ Shibata K, Fukuwatari T, Imai E, Hayakawa T, Watanabe F, Takimoto H, Watanabe T, Umegaki K (2013). "Dietary Reference Intakes for Japanese 2010: Water-Soluble Vitamins". Journal of Nutritional Science and Vitaminology. 2013 (59): S67–S82. ^ "Changes to the Nutrition Facts Panel – Compliance Date". US Department of Agriculture. Retrieved 9 August 2018. ^ Finglas, PM; Roe, MA; Pinchen, HM; Berry, R; Church, SM; Dodhia, SK; Farron-Wilson, M; Swan, G (2015). McCance and Widdowson's The Composition of Foods, Seventh Summary Edition. Cambridge: The Royal Society of Chemistry. ISBN 978-1-84973-636-7. ^ Owens, Janel E.; Clifford, Andrew J.; Bamforth, Charles W. (2007). "Folate in Beer". Journal of the Institute of Brewing. 113 (3): 243–248. doi:10.1002/j.2050-0416.2007.tb00283.x. ISSN 0046-9750. ^ "USDA Nutrient Database (Table)". United States Department of Agriculture. Archived from the original on 10 August 2014. Retrieved 14 August 2014. ^ a b "Effects of Cooking on Vitamins (Table)". Beyondveg.com. Archived from the original on 16 October 2012. Retrieved 9 September 2012. ^ "EC 1.5.1.3". Us.expasy.org. Archived from the original on 13 June 2011. Retrieved 9 September 2012. ^ Benkovic SJ, Hammes-Schiffer S (2003). "A perspective on enzyme catalysis". Science. 301 (5637): 1196–1202. Bibcode:2003Sci...301.1196B. doi:10.1126/science.1085515. PMID 12947189. ^ Stover P, Schirch V (1990). "Serine hydroxymethyltransferase catalyzes the hydrolysis of 5,10-methenyltetrahydrofolate to 5-formyltetrahydrofolate". J. Biol. Chem. 265 (24): 14227–14233. PMID 2201683. ^ a b Hoffbrand AV, Weir DG (2001). "The history of folic acid". Br. J. Haematol. 113 (3): 579–589. doi:10.1046/j.1365-2141.2001.02822.x. PMID 11380441. ^ a b Bailey SW, Ayling JE (September 2009). "The extremely slow and variable activity of dihydrofolate reductase in human liver and its implications for high folic acid intake". Proceedings of the National Academy of Sciences of the United States of America. 106 (36): 15424–15429. Bibcode:2009PNAS..10615424B. doi:10.1073/pnas.0902072106. PMC 2730961. PMID 19706381. ^ Dietrich M, Brown CJ, Block G (2005). "The effect of folate fortification of cereal-grain products on blood folate status, dietary folate intake, and dietary folate sources among adult non-supplement users in the United States". J Am Coll Nutr. 24 (4): 266–274. doi:10.1080/07315724.2005.10719474. PMID 16093404. ^ a b Quinlivan EP, Gregory JF (2003). "Effect of food fortification on folic acid intake in the United States". Am J Clinical Nutrition. 77 (1): 221–225. doi:10.1093/ajcn/77.1.221. PMID 12499345. ^ Chustecka Z (2009). "Folic-acid fortification of flour and increased rates of colon cancer". Medscape. Retrieved 9 November 2009. ^ "Folic Acid Fortification". Food Standards Australia New Zealand. 2016. Retrieved 25 September 2018. ^ "Work Starts on Wilkinson's Mass Medication Plan" (Press release). Association Of Bakers. 8 July 2009. Archived from the original on 10 July 2009. Retrieved 13 July 2009. ^ "NZ should push pause on folic fortification" (Press release). Green Party. 9 July 2009. Archived from the original on 10 July 2009. Retrieved 13 July 2009. ^ NZPA (8 July 2009). "Bakers, Govt battle over folic acid". NZ Herald. Retrieved 13 July 2009. ^ Houghton LA (2014). "A country left behind: folic acid food fortification policy in New Zealand". N. Z. Med. J. 127 (1399): 6–9. PMID 25145300. ^ "Welcome to the Health Canada Web site". Hc-sc.gc.ca. Archived from the original on 10 September 2012. Retrieved 9 September 2012. ^ Mason JB, Dickstein A, Jacques PF, et al. (2007). "A temporal association between folic acid fortification and an increase in colorectal cancer rates may be illuminating important biological principles: a hypothesis". Cancer Epidemiol. Biomarkers Prev. 16 (7): 1325–1329. doi:10.1158/1055-9965.EPI-07-0329. PMID 17626997. ^ De Wals P, Tairou F, Van Allen MI, et al. (2007). "Reduction in neural-tube defects after folic acid fortification in Canada". N. Engl. J. Med. 357 (2): 135–142. doi:10.1056/NEJMoa067103. PMID 17625125. ^ FSA (17 May 2007). "Board recommends mandatory fortification". Archived from the original on 24 June 2007. Retrieved 18 May 2007. ^ "Backing for folic acid in bread". BBC News. 17 May 2007. Archived from the original on 18 June 2007. Retrieved 18 May 2007. ^ "Why fortify?". Food Fortification Initiative. 2017. Archived from the original on 4 April 2017. Retrieved 4 April 2017. ^ Malinow MR, Duell PB, Hess DL, et al. (1998). "Reduction of plasma homocyst(e)ine levels by breakfast cereal fortified with folic acid in patients with coronary heart disease". N. Engl. J. Med. 338 (15): 1009–1015. doi:10.1056/NEJM199804093381501. PMID 9535664. ^ Daly S, Mills JL, Molloy AM, et al. (1997). "Minimum effective dose of folic acid for food fortification to prevent neural-tube defects". Lancet. 350 (9092): 1666–1669. doi:10.1016/S0140-6736(97)07247-4. PMID 9400511. ^ Crandall BF, Corson VL, Evans MI, Goldberg JD, Knight G, Salafsky IS (1998). "American College of Medical Genetics statement on folic acid: fortification and supplementation". Am. J. Med. Genet. 78 (4): 381. doi:10.1002/(SICI)1096-8628(19980724)78:4<381::AID-AJMG16>3.0.CO;2-E. PMID 9714444. ^ "FDA muffed chance to reduce birth defects". Boston Globe. 6 January 2004. Archived from the original on 13 March 2007. ^ Lewis CJ, Crane NT, Wilson DB, Yetley EA (1999). "Estimated folate intakes: data updated to reflect food fortification, increased bioavailability, and dietary supplement use". Am. J. Clin. Nutr. 70 (2): 198–207. doi:10.1093/ajcn.70.2.198. PMID 10426695. ^ Centers for Disease Control and Prevention (CDC) (2004). "Spina bifida and anencephaly before and after folic acid mandate—United States, 1995–1996 and 1999–2000". MMWR Morb. Mortal. Wkly. Rep. 53 (17): 362–365. PMID 15129193. Archived from the original on 2 June 2013. ^ "Birth Defects COUNT | Folic Acid | NCBDDD | CDC". www.cdc.gov. Archived from the original on 13 November 2015. Retrieved 16 November 2015. ^ Choumenkovitch SF, Selhub J, Wilson PW, Rader JI, Rosenberg IH, Jacques PF (2002). "Folic acid intake from fortification in United States exceeds predictions". J. Nutr. 132 (9): 2792–2798. doi:10.1093/jn/132.9.2792. PMID 12221247. ^ "TABLE 1: Nutrient Intakes from Food and Beverages" (PDF). What We Eat In America, NHANES 2012–2014 (2016). Retrieved 12 October 2018. ^ a b c d Lanska, DJ. (2009). Chapter 30 Historical aspects of the major neurological vitamin deficiency disorders: the water-soluble B vitamins. Handb Clin Neurol. Handbook of Clinical Neurology. 95. pp. 445–476. doi:10.1016/S0072-9752(08)02130-1. ISBN 978-0-444-52009-8. PMID 19892133. ^ Wills L (1978). "Nutrition Classics. British Medical Journal 1:1059–64, 1931. Treatment of "pernicious anaemia of pregnancy" and "tropical anaemia" with special reference to yeast extract as a curative agent. By Lucy Wills". Nutr. Rev. 36 (5): 149–151. doi:10.1111/j.1753-4887.1978.tb03735.x. PMID 355948. ^ Mitchell HK, Snell EE, Williams RJ (1941). "The concentration of "folic acid"". J Am Chem Soc. 63 (8): 2284. doi:10.1021/ja01853a512. ^ Angier RB, Boothe JH, Hutchings BL, et al. (1945). "Synthesis of a Compound Identical with the L. Casei Factor Isolated from Liver". Science. 102 (2644): 227–228. Bibcode:1945Sci...102..227A. doi:10.1126/science.102.2644.227. PMID 17778509.